Back in the hotel, I mentioned the incident to my editor. He said that I was the crazy one: what I had seen was a sort of exercise called “Nordic walking”. He explained that besides the movement of the legs, the arms, shoulders and back muscles are also used to make it a much more complete exercise. When I go for a walk ( which is my favorite pastime, together with archery), it is to be able to reflect, think, look at all the marvels around me, and chat with my wife while we are walking along. I found my editor’s comment interesting, but thought no further of it. One day I was in a sports store buying material for my arrows when I noticed new poles used by mountaineers – made of aluminum, they are light and can be opened or closed using the same telescopic system as a tripod for a camera. 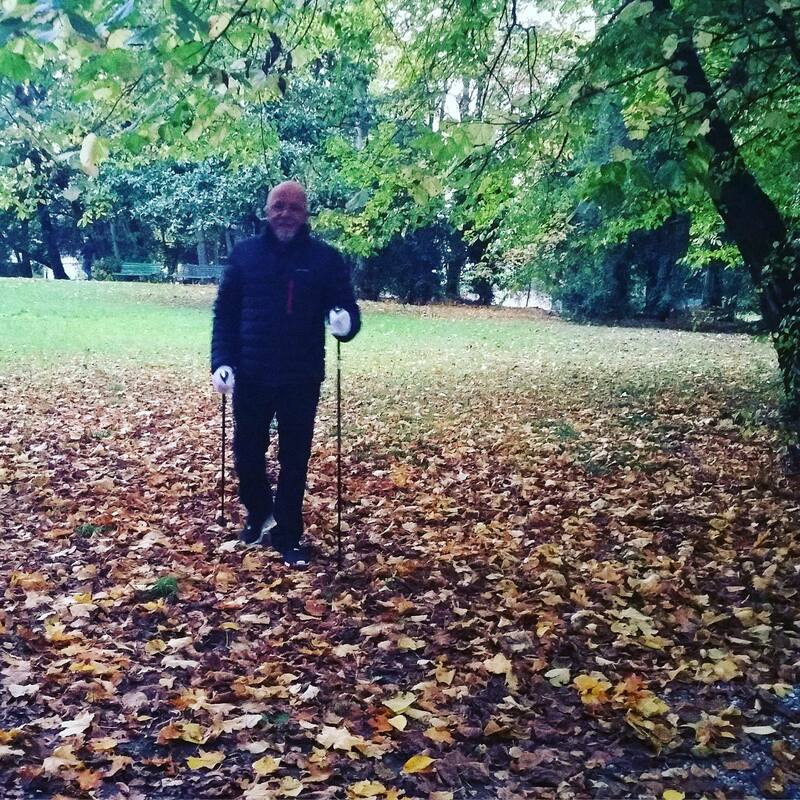 I remembered the Nordic walking and thought to myself: why not try it? I bought two pairs, for myself and my wife. We adjusted the poles to a comfortable height and the next day decided to try them out. What a fantastic discovery! We climbed a mountain, then came back down, really feeling that the whole body was in movement, the balance was better, we were less tired. We walked double the distance we usually cover in an hour. I remembered that I had once tried to explore a dried-up stream but it was so difficult with all the stones that I gave up. I thought that with the poles it would be easier, and I was right. My wife got into the Internet and discovered that you burn 46% more calories than on a normal walk. She grew very enthusiastic and “Nordic walking” has become part of our daily routine. One afternoon, just for distraction, I also decided to get into the Internet to see what I could find on the subject. I was surprised to see page after page, with federations, groups, discussions, models and … rules! I don’t know what made me open the page about rules. As I read I became horrified – I was doing it all wrong! My poles should be adjusted higher, a certain rhythm had to be followed, a certain angle of support had to be kept, the shoulder movement was complicated, the way of using the elbow was all different, everything followed rigid, technical, precise rules. I printed all the pages. The following day – and the others that followed – I tried to do exactly as the specialists ordered. The walk began to lose interest, I no longer saw all the wonders around me, I spoke very little to my wife, I could think of nothing except the rules. At the end of a week I asked myself: why am I learning all this? My objective is not to do gymnastics. I don’t think that the first people who did their “Nordic walking” had anything in mind apart from the pleasure of walking, improving their balance and moving the whole body. We knew intuitively what was the ideal height for the poles, just as we could intuitively deduce that the closer they were to the body, the better and easier the movement. But now, because of the rules, I had stopped concentrating on the things I liked and was more concerned about losing calories, moving my muscles and using a certain section of the spine. I decided to forget all that I had learned. Now we go out walking with our two poles, enjoying the world around us and feeling happy at seeing the body being made to work, being moved and balanced. And if I want to do gymnastics instead of “meditation in movement”, I’ll look for a gymnasium. At the moment I am quite content with my relaxed and instinctive “Nordic walking”, even though I may not be losing 46% more calories. I’ve no idea why human beings have this mania of setting rules to everything.